Richard Alston Dance Company in A Ceremony of Carols. © Dave Morgan. Taking notes at a performance by Richard Alston’s dancers is – for me, at least – a pointless occupation. Descriptive words and points of reference fly past in an unending stream, like Canada Geese migrating for the winter: start writing and you are never likely to stop! A better tip is simply to absorb it all. Let the musicality and shapes of the movement flow over you and the dancers become like the Shades in Solor’s dream. And all without the aid of opiate inducement! A deep empathy with music is the ingredient that makes Alston’s work – and his dance troupe – extra special and I doubt that this is ever more powerful than in ‘Roughcut’, originally choreographed during his time as Director of Rambert, some 20 years’ ago, and now reconstructed by Martin Lawrance. Bones, flesh, soul and vitality are added to Steve Reich’s back-to-back, minimalist scores for clarinet and tape (‘New York Counterpoint’, 1986) and guitar and tape (‘Electric Counterpoint’, 1987 – later used in Christopher Wheeldon’s eponymous creation for The Royal Ballet). How the dancers count through these unhelpful, multiple layers of looped sound is a miracle. The ensemble doesn’t so much dance in or on the music but through it in a continual stream of fluid beauty that brings life-force into Reich’s pulsing, syncopated sounds. One of the always-fascinating aspects of Alston’s work is how he creates such marvel out of what is essentially a standard catalogue. It may be thicker than the Greater London telephone directory but it is rare to see movement in an Alston or Lawrance work that doesn’t fit within those pages; and yet, every work – old, new or revitalised – always seems fresh and vibrant. I have never cracked the conundrum of Alston’s choreography being instantly recognisable and yet every work has a unique character. In ‘Lie of the Land’, Martin Lawrance echoes Alston’s impeccable sense of timing, regularly changing or refreshing the mood through the episodic sequencing of dances for different groupings among his septet of dancers. As in ‘Roughcut’, lighting plays a major part in turning the page at each strategic moment; and there is a satisfying completeness about both pieces, each lasting for just the right amount of time and ending with emphasis in a bang and not a whimper. Richard Alston Dance Company and choristers of Canterbury Cathedral in A Ceremony of Carols. © Dave Morgan. 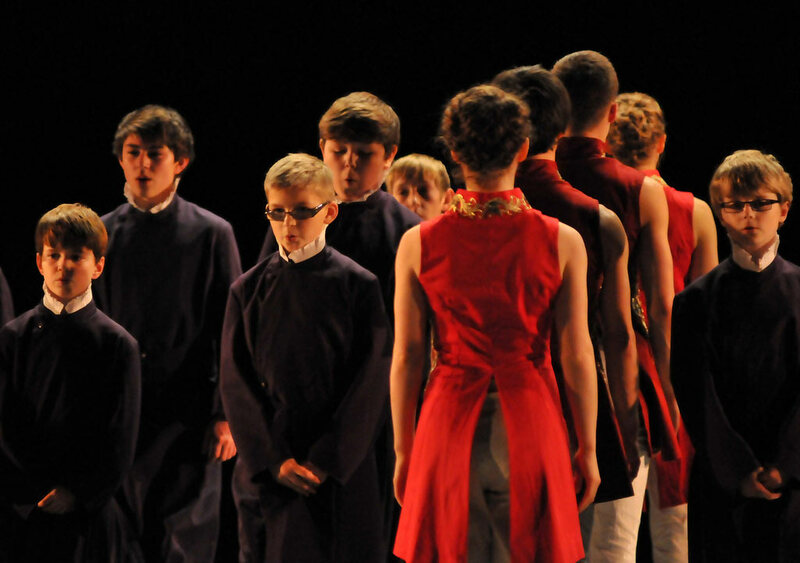 The new work in this mixed bill was ‘A Ceremony of Carols’, co-commissioned by the Marlowe Theatre in Canterbury (where the world premiere was held on 8 February), Sadler’s Wells and Peak Performances @ Montclair State in New Jersey. Where ‘Roughcut’ screams Alston as its creator, this latest work comes heavily disguised. It is formulaic in a military or (more accurately in a choral context) processional style, with the large ensemble (augmented by final year students from the London Contemporary Dance school) often arranged in rank and file. Composed by Benjamin Britten as a setting for mediaeval verse that he found while rummaging in a second-hand bookstore – in Nova Scotia, during WW2 – these twelve hauntingly simple songs were performed by the boy choristers of Canterbury Cathedral (commanded by the Cathedral’s Director of Music, Dr David Flood) with the solo to ‘Balulalow’ (the fifth of the carols) and the closing ‘Spring Carol’ and ‘Deo Gracias’ being particular highlights. 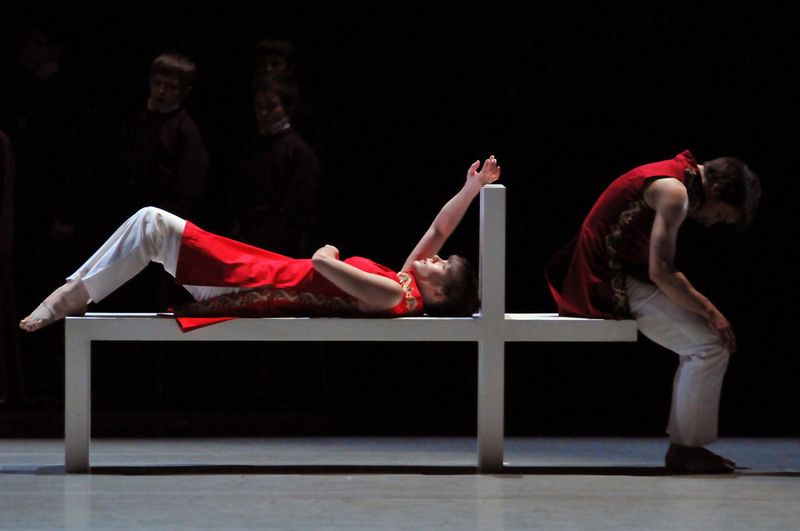 A rather striking white bench that turned into an even more impressive crucifix was the only set embellishment and the dancers’ short tunics cleverly offset the choristers’ robes. A setting that resonated with the humility and sobriety of Britten’s music developed through Alston’s choreography into a powerful, celebratory and joyful expression. The dancers – as throughout the programme – were never less than a joy to watch in this cleansing, uplifting evening of ceremonial, cerebral and celestial entertainment.